• Single level, rectangular structure divided into 3 sections of bays. • Large double doors centered on both long sides of structure. • Hand threshing with grain flail done in central bay called the threshing floor or threshing bay. • Bays on either side of central bay were used to store sheaves of harvested grain in one and threshed grain in bins and straw in the other. • This type of barn was traditionally associated with grain farming a single function structure. • English and Continental European people introduced this style. It was strongly associated with wheat production. It was sometimes referred to as a Yankee Barn. • This was a prevalent Northern Illinois style from time of settlement in 1830's through probably the 1860's while wheat was grown and before dairying took over in 1870's. • These barns were sometimes modified to house livestock in one bay. • Four bents or system of timber defined the 3 bay barn; 2 on the outer perimeter and 2 on the interior. There was usually 16' between bents (the space needed for properly sheltering a team of horses or oxen). • When the bent was not 16', it was usually a distance that could be divided evenly into the barn's total length. Most structures measured between 24' & 40' in width and 48' & 60' in length. The distance from ground to roof peak was about 30'. • Mostly masonry construction for single level barn is usually fieldstone. Foundations usually extended 18" below frost line. These walls usually 2 to 3' in thickness and extended 1 2 to 2' above ground level. Variations on the foundations included erecting a series of strategically placed stone piers at each corner or at locations where load bearing vertical members joined the sill timber. Sometimes farmers built on extremely level ground to use a single flat topped boulder, rather than a pier, at each location. Quarried stone or brick materials were other variants. • Typically a gable roof composed of rafters, rough sawn boards, and wooden shingles. Unlike the major timbers in the frame, the rafters were not hewn square. Sometimes they were left rounded with only the upper side hewn so roofing boards could easily be attached to the flat surface. Others were sawn. Sets of rafters were fitted and joined at the peak with either nails or wooden pegs. Ridge poles were rare. Roof boards typically were wide, often in excess of 12". They sometimes retained the bark on their outer edges. Boards were arranged in rows, usually several inches apart. Machine made wooden shingles were the most popular shingles but hand split ones (although more labor intensive) could be a less expensive alternative compared to the foundation, or timber-frame skeleton, roofing fabric often underwent greater degrees of alteration over time. • These early barns were covered with vertically attached boards, some as large as 14" wide. They ran from sill to plate. Two levels of siding were required on the gable ends. A 1" space was left between boards. When the barn housed animals, especially horses, open spaces were covered by wooden battens to reduce drafts. Square headed, cut nails were originally used. • The large set of double doors which allowed access to the threshing floor was the most prominent feature. Though originally hung with hand-forged strap hinges, many were modified to suspend from a track. Sometimes a row of single pane transom windows capped the door openings. Within one of the double doors a human size cold weather access door was cut. When the threshing barn was modified to provide space for livestock, additional openings appeared. Openings for light or ventilation occasionally appeared on the gable. These designs sometimes were called owl holes. 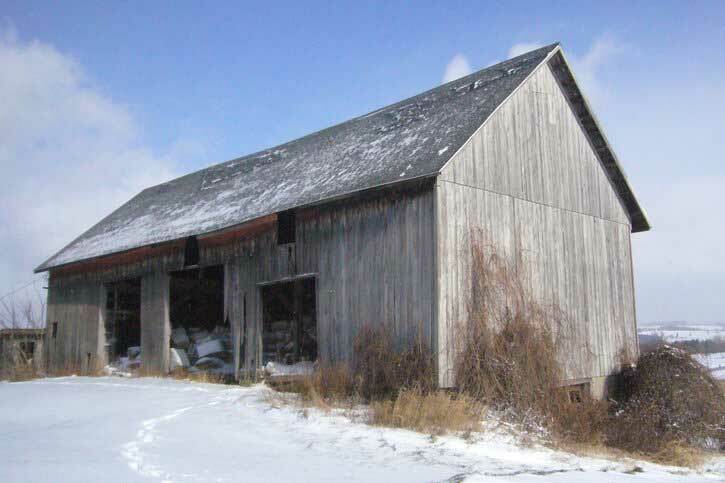 • In the Midwest, as the agri-economy moved from grain production to animal raising, farmers adapted the 3 bay barn by providing a basement under the original single level. Sometimes the threshing barn was moved to a hillside location. On flat lands, farmers added an earthen ramp leading to the elevated bays. When a new 3-bay basement barn was constructed, they were usually made larger (40'-50' widths and 60'-100' lengths) to accommodate dairying. This was an advantage to adapting an old 3-bay. Sources: • A The Three-Bay Threshing Barn@ by Charles Calkins and Martin Perkins in Barns of the Midwest ed. by Allen G. Noble & Hubert G.H. Wilhelm. An immense skeletal framework of oak, elm, hemlock, chestnut or maple. Large timbers were used for the sill, plate or joist members. Smaller logs of lesser length and diameter were unsuited for hewing. They were sometimes left in their natural rounded state. Could also be easily transported by wagon to sawmill and processed into support beams by water powered vertical saws. A mortise and tenon joint system of structural connections. On some larger load bearing connections multiple pegs were often employed. The skeletal framework rested on sill timbers which rested directly on the foundation called the substructure. This frame was made up of two longitudinal and transverse squared timbers. The sill pieces usually joined at the corners with a mortise and tenon connection. Builders notched or mortised floor joists into the base members. Though the sills were squared, sometimes the joists were left round except for the top side. Flooring under the central bay usually received special reinforcement. Bents were connected to each of the transverse sill timbers. The bents were preassembled. Bents were made in a variety of designs but were mostly derivations of 1 basic form: 3 structural elements, 2 vertical posts and a single horizontal tie beam (girt). Builders adapted the frame to the farmers needs by adding various upright, girt and brace timbers a typical modification included a 3rd vertical post near the center which functioned as one side of a built in ladder. Sometimes sawn braces reinforced the mortise and tenon joinery which tied the posts into the girt. Following the erected bent system, builders capped the exterior posts with hewn plate timber. The plate secured the upper ends to the outer posts. Uprights were tenoned into the plate as they were to the sill.